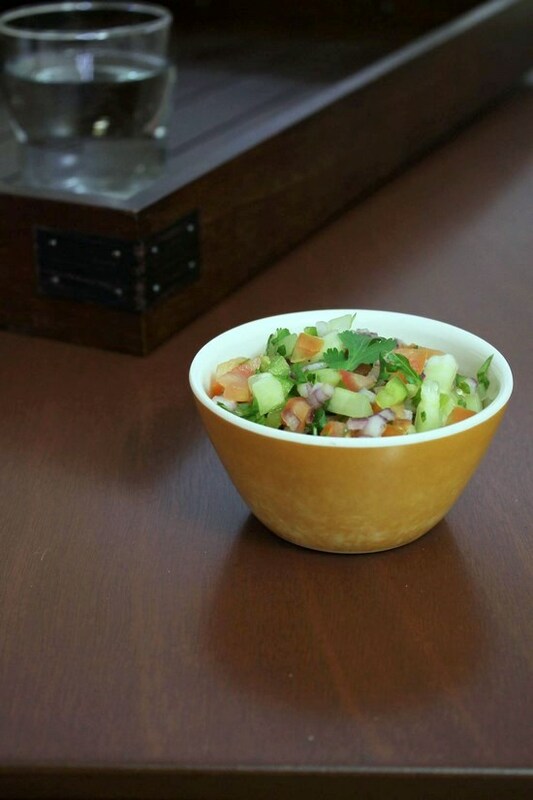 Kachumber Salad – Indian style simple vegetable salad made with onion, tomato and cucumber. The crunchy vegetables with refreshing flavors. This kachumbar recipe is my go to salad for our dinner other than this warm cabbage salad. 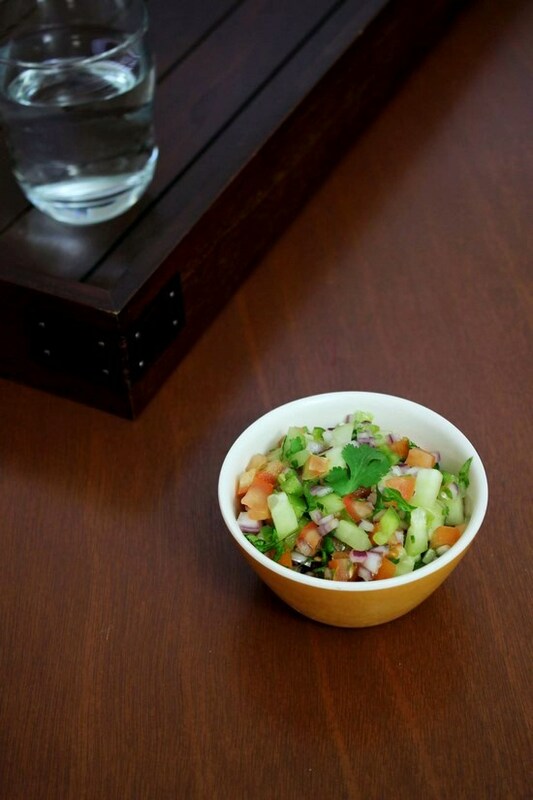 Whenever I am making roti-sabzi or dal-rice, I must make this salad to serve on side. If you are an Indian then you probably know what it is. It is very commonly served along with any kind of meal. I was not planning to share this simple recipe here. But gave some thought process and came to the conclusion that I must share it as it is pack of nutrition. One need to balance the diet by including raw veggies. Serving suggestion: Serve this on side with your meal. I have peeled the cucumber. My cucumber has really thick skin. If you want you can keep it on. If you want to make this ahead of time, then mix everything except onion, lemon juice and salt. Keep in fridge covered. Right before serving chop onions, mix with salad along with salt and lemon juice. You know raw chopped onion will have strong smell, no one likes this smell in kitchen. Because of the salt, veggies will leave its water. So add it right before serving. During summer mint leaves will be in season. If you have it handy, add few chopped leaves. It gives really nice refreshing flavors. For variation, you can add chopped cabbage, grated carrot or beetroot. Kachumber usually made with onion, tomato and cucumber. But this time I have also added capsicum. Remove the seeds and stem of the chili. I don’t want my salad to be spicy, so I removed seeds. If not comfortable with eating raw chili then skip it. If serving later (means after 1 or 2 hours) then mix all except onion, salt and lemon juice and keep in the fridge covered. Add these three ingredients right before serving.